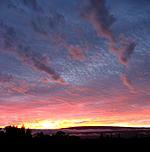 The Big Island of Hawai'i is the most southern and eastern island in the Hawaiian Island chain. 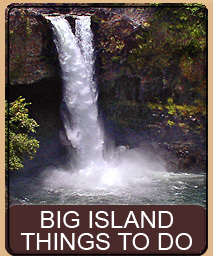 The Big Island is also the most southern state in the United States. As with all the islands in the chain, the Big Island is completely formed from volcanoes. The Hawaiian Islands sit over a hotspot in the earth's crust. As the plate slowly drifts west-northwest the hotspot generates new islands. The Big Island is the youngest of the islands in the chain and is still forming by active volcano. 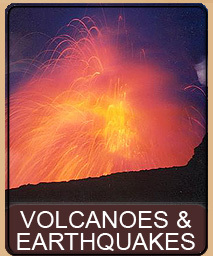 The Big Island consists of five volcanoes. The oldest is the Kohala volcano in the northern part of the Big Island and emerged from the ocean about 460,000 years old and is now extinct. The second volcano, Mauna Kea is dormant and last erupted about 4,500 years ago. Mauna Kea is also the world's tallest mountain measured from its base - at over 33,480 ft tall. Only the top 13,840 ft. of Mauna Kea is above sea level. The third oldest volcano is Hualālai in the Kailua-Kona area. Hualālai, which is still considered active, last erupted about 200 years ago and could erupt again. Fourth on our list is Mauna Loa which last erupted in 1984 and is considered active and is currently inflating and may erupt again in the near future. Mauna Loa also is the world's most massive mountain and according to a study done by Grant Kaye, a geology doctoral student at OSU, "Mauna Loa is so massive that it deforms the oceanic plate on which it sits and forms sort of an inverted cone which is almost as large below the sea floor as the portion that extends above it." The youngest volcano on the Big Island is Kilauea, which has been erupting non-stop since January 1983. Kilauea is also the most active volcano on the planet and hundreds of thousands of visitors flock to its highly accessible lava flows each year. The Hawai'i Volcanoes National Park near the town of Volcano is the second largest tourist attraction in the state, bested only by Pearl Harbor. The island chains continue to grow. Just 20 miles off the south east coast of the Big Island, a new volcano is forming under the ocean. Named Lō'ihi, this new island is still about 3000 ft below sea level and is currently active and growing. Little is known about the exact date of the arrival of the first Hawaiians. 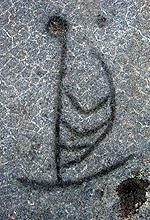 From scant archeological clues a rough date is that first contact occurred approximately 1,600 years ago. The first voyagers were most likely from the Marquesas Islands and Tahiti. The early explorers were not lost fishermen but instead were highly skilled navigators and explorers. The early explorers had outstanding knowledge and skill at navigating by the stars and ocean currents, and used them to chart passages through the vast ocean. 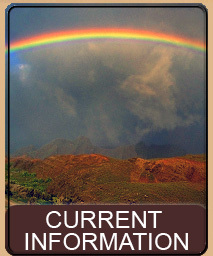 The first contact with Hawai'i was thought to have been at South Point on the Big Island. Certainly, once the explorers were close to the islands, the glow of the active volcanoes would have brought them to the Big Island. 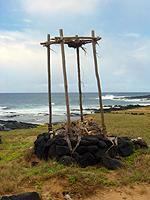 The oldest recorded Heiau (temple) on the Big Island has been dated to 500 AD. By about 900 AD it is believed that Hawaiians had occupied all the other major islands in the chain. 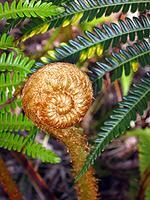 Because of the lack of mammals on the Islands the early Hawaiians ate mostly vegetables, fish and seaweeds. Many of their favorite foods were brought to the islands in their canoes in the form of seeds and seedlings, to be planted upon arrival. To be sure, the Hawaiians also brought chickens and pigs along with the vegetables, thus introducing land mammals to the islands. Around 1175 AD a priest from Tahiti arrived on the Big Islands. 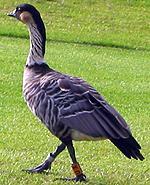 Ancient chants call him Pa'ao, and he initiated the high-priest line and the ruling kings for each island. One of the kings that came from Tahiti was Pili who started the royal line that led to the great Hawaiian King Kamehameha. Pa'ao did great damage to the peaceful Hawaiian culture of the time. He was upset that the Hawaiians had eased up on their religion and ceremonies and invaded the land killing most of the priests, changing the religion and introducing the kapu system of forbidden objects and actions. Kane - provider of nature, the sun and water. Ku - the God of war. Lono - the God of agriculture, fertility, peace and natural phenomena. 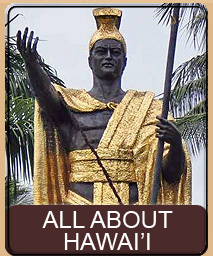 In 1758 the great King Kamehameha I was born on the Kohala coast of the Big Island. He was a unifier of the islands and brought the various kingdoms together through both war and skillful negotiations. Though there is some evidence that Hawai'i was visited by Spanish sailors around 1627 AD, the first true recorded arrival of westerners occurred in 1778 when Captain James Cook and his crews on the HMS Resolution and HMS Discovery see O'ahu. Cook officially names the islands the Sandwich Islands. At the time of his arrival the population of the islands were estimated to be between 400,000 and 800,000 Hawaiians. 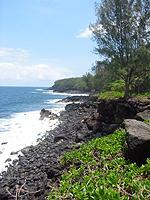 About a year later, on January 17, 1779, Captain Cook and his boats sail into Kealakekua Bay on the Big Island. 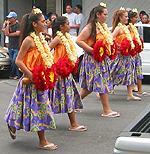 The timing was extraordinary because at that very moment the Hawaiians were celebrating a festival to their God Lono. Part of the celebration included a banner made of white cloth draped on a tall pole. When Captain Cook sailed into the bay the sails of his ship resembled the banner and led the Hawaiians to think that Captain Cook was Lono. Captain Cook was honored as their God and was given many gifts from King Kalaniopuu. After about a week on the Big Island, Captain Cook and his men sailed out of the bay. About a week after leaving Kealakekua Bay, Captain Cook returned with a broken sail. This time things did not work out so well as before. After a serious argument occurred, Captain Cook showed a moment of weakness that convinced the Hawaiians that he was not their God Lono. The Hawaiians attacked and Captain Cook was killed on the shore. The monument to his landing and death is on the shores of Kealakekua Bay. The small area of land that the monument sits on is official land of Britain and a British warship comes each year to clean and preserve the monument. Unfortunately, not only did contact with western civilization destroy a robust and strong culture, it also introduced diseases to the Hawaiians that they had never been in contact with before. Simple diseases that most every western child has killed hundreds of thousands of strong Hawaiians and brought their population to chilling numbers - as low as 40,000 by 1890. In 1793 the British began trading with King Kahekiki of O'hau. A year later King Kamehameha granted power of the Big Island to Captain George Vancouver and Britain (this in part is where the Hawaiian flag, with the British coat of arms on it, comes from). In 1794 King Kamehameha united the Hawaiian Islands and ruled them until his death in 1819. The death of Kamehameha I divided his power and made way for the missionaries to arrive. Six missionaries arrived shortly after 1819 to begin to convert the native Hawaiians to Christianity. In order to rid the Hawaiians of their heathen (as viewed by the missionaries) ways, much of the native culture was banned. Speaking in Hawaiian was greatly discouraged and hula and chanting were strictly banned. 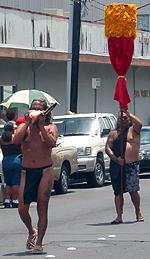 Hawaiians were often forced to wear European clothing and were taught to view their Hawaiian heritage as bad. 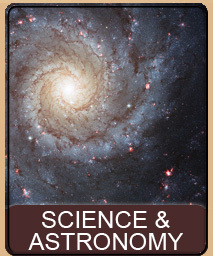 From 1874 through 1891 King David Kalakaua attempted to preserve the culture, science, and art of the Hawaiians. It was his efforts of the time that preserved quite a bit of the knowledge we have today about the ancient ways and customs. Throughout the late 1800s Hawai'i was exporting cane sugar and coconuts around the world. Many of the missionary sons and daughters became plantation owners and possessed quite a bit of the land, and most of the crops that were being exported. However, in 1826 the United States had recognized Hawai'i as a sovereign nation and thus had imposed tariffs on products coming from the islands. This, of course, upset the plantation owners who, as Americans viewed this as an improper taxation - the solution of which was for them to have Hawai'i absorbed into the United States. I, Lili`uokalani, by the grace of God and under the constitution of the Hawaiian Kingdom, Queen, do hereby solemnly protest against any and all acts done against myself and the constitutional government of the Hawaiian Kingdom by certain persons claiming to have established a Provisional Government of and for this Kingdom. That I yield to the superior force of the United States of America, whose Minister Plenipotentiary, His Excellency John L. Stevens, has caused United States troops to be landed at Honolulu and declared that he would support the said Provisional Government. Now, to avoid any collision of armed forces and perhaps loss of life, I do, under this protest, and impelled by said forces, yield my authority until such time as the Government of the United States shall, upon the facts being presented to it, undo the action of its representative and reinstate me in the authority which I claim as the constitutional sovereign of the Hawaiian Islands. Because the Queen surrendered Hawaii's sovereignty to the US it put the US in the position of having illegally invaded and overthrown a foreign nation without cause. However, Harrison's term in office was just about over and the new President, Grover Cleveland realized the illegality of the situation and withdrew the treaty. However, when the provisional government (run by Sanford Dole, brother to the Dole Pineapple owner) was told to give power back to the queen they refused. President Cleveland did all he could to champion the cause to restore Hawai'i to the Hawaiians but unfortunately the American Congress took no action to annex or restore Hawai'i. The inaction of the US forced Dole and his puppet government to declare himself President of a new Republic of Hawai'i. This resulted in a huge uprising in 1895. Queen Lili'uokalani was charged with treason and arrested and was made a prisoner in her own palace. She was finally freed late in 1896. Upon her freedom she immediately went to Washington DC to talk with President Cleveland, but he could at that time be of no further help. Hawai'i was annexed by the next president, William McKinley on August 12, 1898 - with Dole as the new governor. Life continued, after the overthrow, but power was now in the hands of the Americans and mostly white plantation owners. Hawaiians were hired as workers to toil in the hard, hot fields for their plantation masters. However, in order to control the Hawaiians, workers were imported from other countries. When any one group started getting large enough in population to cause a threat to the plantation owners, they would merely import new labor from somewhere else in the world. This caused a huge influx of different societies, from all over Asia and even Mexico. The variety of groups in the island meant that eventually intermarriage would begin - greatly diluting the various races and decreasing even more the number of pure Hawaiians as well as the purity of the language and culture. Sadly, Hawaiian language and customs continued into decline up until about 1970. In 1978 the US recognized Hawaiian as the second official language of the state (Hawai'i is the only state in the US to have two official languages, English and Hawaiian). A large push went underway to preserve the language and culture and that push continues today as more and more people are once again speaking the Hawaiian language. At the same time another push, from the native Hawaiian population itself, also began to try to undo the wrongs that had been committed against Hawai'i by the US in the illegal overthrow of the nation. It is very important to note that in 1993, President Bill Clinton and Congress signed a law that formally apologized to the Hawaiian Nation for false imprisonment of their Queen and the illegal takeover. However, the US government stopped short of offering any reparations or fixing the situation. Currently there are several movements underway to try to restore at least some Hawaiian sovereignty. Various government groups as well as local Hawaiian groups are all attempting to correct and restore the proper order. Unfortunately the US government seems bent on classifying Hawaiians as Native American Indians and putting them under the control of the Bureau of Indian Affairs - something that is not only laughable - but so obviously wrong. 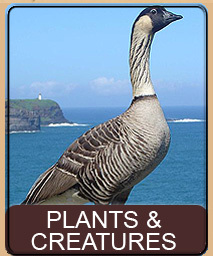 Click here to read more about Hawaiian Sovereignty issues. However, the Hawaiians know how to do it correctly. Akahi Nui, a direct descendant of Queen Lili'uokalani's sister was crowned King of Hawai'i in 1998 by the Hawaiian people. He has been recognized by the United Nations as the true representative of Hawai'i and the Hawaiian people and he has renewed treaties with other nations with the exception of the US. His Majesty Akahi Nui travels the world with a Kingdom of Hawai'i passport that is recognized by most nations. 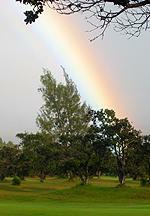 Today, Hawai'i is emerging to once again to be the jewel of the Pacific it originally was. Attempts to maintain the culture, language and heritage of the islands are undertaken not only by locals, but also by people from all over the world. Hula has spread to Japan and the mainland and the language is being taught in schools and spoken more and more. Both local and haole alike are pushing together for the preservation of the Hawaiian culture. Only time will tell if Hawai'i can once again become an independent nation, out from under the shadow of the US - we can only hope. Hawaiian Sovereignty: Do the Facts Matter? This page is named 'Hawaii'. Can't Find It?